Lamptron sent us this package prior to the July 4th holiday (happy birthday America! ), but we weren’t able to get it up before. The Llano review took up all of my time before leaving town. Hopefully it was worth the wait. This controller is very unique. We will be getting one for review when they are available, but in the mean time feast your eyes on the new Lamptron FC-9 and its many colorful configurations! The photos did come with a copy of their newsletter, which contains all the pertinent specs and features. The FC-9 definitely looks like a solid controller. Having only four channels could cause some people alarm; at least until they see that each channel can handle a whopping 50 watts! I think my flock of fans can fuse together to come up with enough of a load to test this beast. We’ll certainly be looking forward to seeing how it performs. Such a nice looking and powerful controller!!! I like the clean look & color options. Also, I like sliders personally. Much easier to visually tell where you're setting them (in case you change things & wanna change them back). LOL, you aren't the first to notice. I've been around for longer than that actually. I'm more of a browser than a poster. Trying to change that. Very nice, the Blue LEDS compliment the Brushed aluminum look. Id be tempted for one in my CM690. :drool: loving the black one with red leds. That's the beauty of it...every color is the same controller, you can change it as you please. As far as 50W/channel, it's helpful for controlling multiple fans on radiators (or just multiple fans period). My rad has 28.8W (three delta screamers rated for .8A/each) on it. 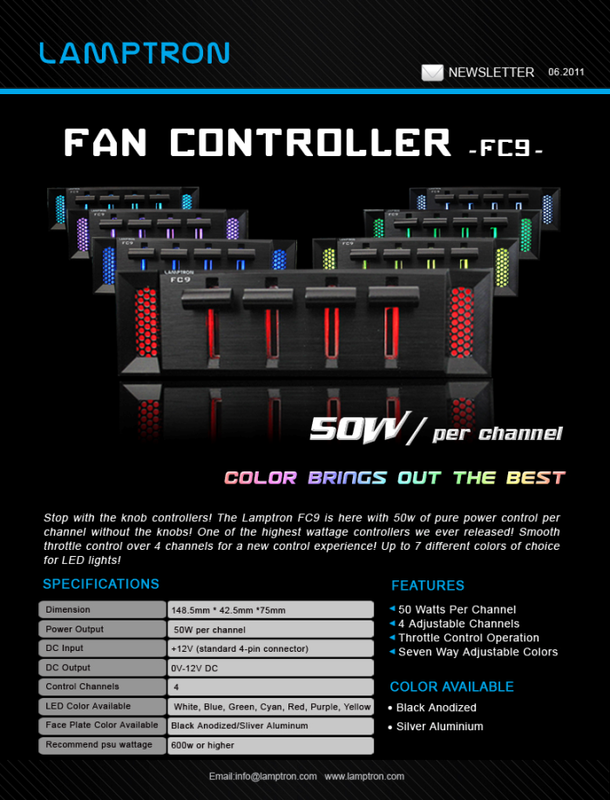 Dumb question.. With it being 50w per channel, Im assuming you could hook 2-3 fans onto one channel? Most definitely, you just need a splitter (or two...or three...). If you want to measure RPM of a fan, you could split the wire off, put just the RPM wire in its own 3-pin plug and stick into one of the headers on your motherboard. That's the easiest way I can think of doing it. any idea of when it will be available? I had been talking to a couple places trying to find fan controllers with more power and finally one comes up but I can't find it anywhere. I've heard a couple of weeks from Lamptron but not a concrete date. I have the sample now and will be getting to it as soon as I can.